After a campaign that has been dogged by objects raining down from the stands as well as pitch invasions and offensive chants, the Ibrox manager admits he is fed up discussing unsavoury antics on the terraces. 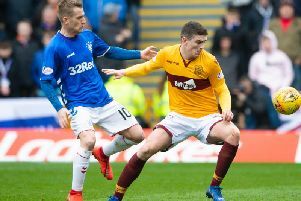 Light Blues captain James Tavernier became the latest player to be targeted by louts when he had to dodge a lighter thrown from the home support during the Light Blues’ clash with Motherwell at Fir Park. Referee Nick Walsh was forced to stop the action after Tavernier was as he ran over to the far touchline to take a throw-in. The official took action to douse the first-half flashpoint when he called in police and stewards to surround the section housing the home side’s ultras group. The incident did not deter Gerrard’s side as they claimed the win thanks to Scott Arfield’s first career hat-trick but the Rangers boss confessed he was frustrated seeing his team’s display once again overshadowed by the behaviour of fans. “It’s a sad thing to see in this league but there’s a lot of it going on and there’s a lot of other sad stuff that’s going on in world football,” he said.